Founded in 1907, Kamenoko Tawashi is a multi-purpose cleaning scrub made from natural fibers, popular in Japan. Visit the store in Yanesen, Tokyo, to learn about this traditional household item and its history, and how you can buy one too. The brand Kamenoko Tawashi and the brand's adorable turtle logo may be unfamiliar, but it symbolizes a Kamenoko Tawashi is a common household good used at homes or in schools in Japan. Not only is it used to clean pots, pans, and dishes, but it can also be used to bathe! The MATCHA editorial team visited one of Kamenoko Tawashi's stores located in the Yanesen area of Tokyo, to learn more about the history behind this incredible invention! Founded in 1907, Kamenoko Tawashi is a brand with over one hundred years of history. The founder, Shozaemon Nishio, is said to have invented the scrubbing brush after seeing his mother painstakingly doing household chores. Born into a poor family, he wanted to create a convenient product as a way to repay his mother for her kindness. After trial and error, Nishio eventually invented his first product, Kamenoko Tawashi No. 1. This scrubbing brush, made of palm fibers, is simple to use and friendly to the environment. It is a scrub that has revolutionized cleaning practices of the past. Nishio thought of the name "Kamenoko" after his son discovered a turtle floating above the waters. He decided to use the name as the shape of the scrubbing brush shared a resemblance with turtles and how it is also a symbolism of longevity and good luck. The main store and factory of Kamenoko Tawashi's is located near JR Itabashi Station. In an effort to introduce the products to youth and overseas visitors, Kamenoko Tawashi opened a branch in Yanesen, Tokyo in 2014. Located within Yanesen district is Yanaka neighborhood, a popular sightseeing destination where one can find many artisan shops. There are a wide variety of products available at Kamenoko Tawashi, Yanesen Store. The approachable staff there are more than happy to provide recommendations for products suited to your needs. The neighborhood's public bathhouse, Asahi-yu, uses Kamenoko Tawashi for cleaning. One of the employees shared that, "without Kamenoko Tawashi, we wouldn't be able to keep the bathhouse in nice condition." The design and quality of Kamenoko Tawashi have remained the same since a hundred years ago. By taking care of the density of palm fibers and using the skills of veteran artisans, Kamenoko Tawashi is able to continue making scrubbing brushes that are durable and excellent for cleaning. Continued to be loved for generations, this classic product was awarded the Good Design Long Life Design Award in 2013. One of the shop manager's highly recommended products is the Windmill Palm Tawashi. Its fine fibers are strong and flexible, allowing dirt to be removed precisely. It also dries quickly. The Windmill Palm Tawashi is even suitable to be used on porcelain ware. Also, chefs share that, "one can not do without the Windmill Palm Tawashi for cleaning wooden cutting boards!" On the day of its release, the Kamenoko Sponge was a huge hit and sold at major Japanese apparel stores, such as BEAMS and UNITED ARROWS. 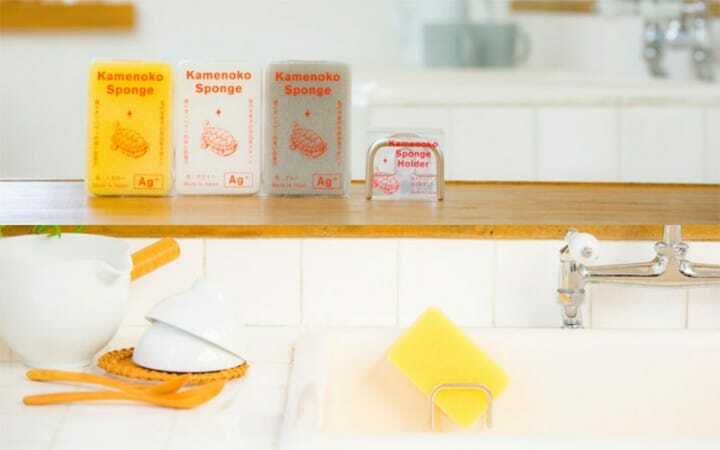 The Kamenoko Sponge contains silver ion components that are anti-bacterial. Within 6 hours after using the sponge, most of the bacteria linked to food poisoning are killed according to findings from the Japan Food Research Laboratories. Another notable point is the thickness of the sponge. At 2.7cm, it is easily grippable, making for effortless dish washing. Kamenoko Tawashi also sells other types of scrubbing brushes. The adorable seashell-looking patterned scrubs are the Shiroi Tawashi, made of sisal hemp. This scrubbing brush is for cleaning mild stains and does the job even without detergent. It has a soft texture and adds a nice decoration to your kitchen. These colorful pocket-size scrubbing brushes are called Shima Shima. They are made of white palm and polypropylene. These handy scrubbing brushes are perfect for cleaning bento boxes and fishing tools. They are an all-purpose item that makes a great companion for outdoor activities. Scrubbing brushes that come a little larger in size are part of the Kenko Tawashi series. These products are meant for bath time use for massaging the body or exfoliation. They come in four types of varying materials and hardness. Each product is named after the surname of an employee at Kamenoko Tawashi. For example, an employee named Sato is known for their gentle personality, hence the scrubbing brush with the softest material is named Sato-san. Limited Edition Products and Souvenirs! The shop also carries fun souvenirs in addition to scrubbing brushes. The Kamenoko Key Holder is a recommended item at the store. It is a key holder that comes with a golden turtle and miniature scrubbing brush. The retro packaging contains words of blessings and well wishes for health, love, luck, and school studies. The tote bag is sold exclusively in stores and is both retro and modern at the same time. It is an item that our MATCHA editorial team was particularly drawn to! The Kamenoko Tawashi brand has thrived and been supported by Japanese artisans for over a century. The high-quality and inventiveness these products continue to meet the expectations of modern society for practicality. Thanks to the corporate effort of Kamenoko Tawashi, consumers can use the incredible product every day. These scrubs have become an indispensable product for kitchens and bathhouses in Japan. It is not just a product that goes unused in the corner of one's kitchen. After visiting the store, the MATCHA editorial team tried out the scrubbing brushes at home. They cleaned air-conditioner filters and bathtubs with ease. They were able to remove dirt without applying too much strength and detergent liquid. Their rooms are now filled with clean, fresh air!